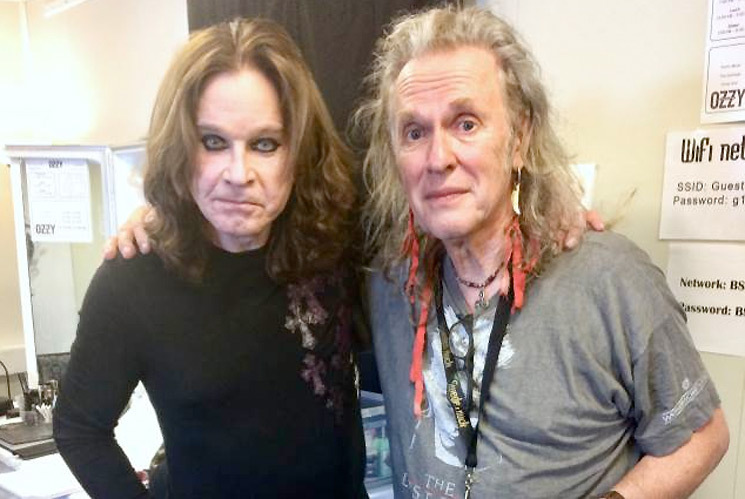 Bernie Tormé pictured on the right alongside Ozzy Osbourne. Bernie Tormé — the former guitarist for Ozzy Osbourne and Gillan — has died. The Irish musician's death was confirmed by his family, revealing Tormé had passed away on Sunday (March 17). He was 66. His family issued the following statement: "Bernie Tormé passed away peacefully on the 17th March 2019, one day short of his 67th birthday, surrounded by his family. He had been on life support for the past four weeks at a London hospital following post-flu complications. Bernie will be remembered for dedicating his life to his music for five decades. He will be sorely missed." Last month, Tormé was hospitalized with double pneumonia, with reports at the time stating he was extremely ill and had been placed on a ventilator. The guitarist played a key role in Ozzy Osbourne's legacy, stepping in for Randy Rhoads when he died suddenly in 1982. However, Tormé played an incredibly brief stint with Ozzy and in fact only performed with the Black Sabbath singer for a little over a week, with Brad Gillis and then ultimately Jake E. Lee taking up guitar duties with Ozzy. That said, over the years Ozzy effectively credited Tormé with saving his solo career in the wake of Rhoads' sudden and tragic passing. Besides that brief though critical time playing with Ozzy, Tormé served as a member of Deep Purple singer Ian Gillan's solo band, Gillan. The guitarist played on such Gillan albums as 1979's Mr. Universe, 1980's Glory Road, and 1981's Future Shock and Double Trouble before leaving the group in '81. Tormé also formed Desperado with Twisted Sister frontman Dee Snider and ex-Iron Maiden drummer Clive Burr, as well as fronted his own project, such as Electric Gypsies and Torme. Last November, Tormé released a new double album called Shadowland.